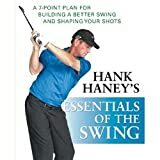 Booklegger Hank Haney's Essentials Of The Swing: In this book, Hank Haney goes beyond tips and quick fixes to lay out the principles behind the perfect swing. Point by point, chapters cover every aspect of the swing, from grip to contact to ball flight, with 160 illustrations to help players understand the concepts and check their form. Using groundbreaking imagery, Nick Bradley’s The 7 Laws of the Golf Swing gives readers an incredibly practical blueprint for golf success by giving them the ability to build and maintain their own winning technique. GOLF Magazine's Top 100 Teachers in America show you even more fast-and-easy ways to hit it farther, play better and shoot lower scores. The greatest teachers are the ones that can translate even the most complicated swing moves into motions and thoughts any golfer can repeat and put into use as early as their next round. GOLF Magazine's stable of Top 100 instructors-the most elite team of teaching experts in the nation-are the best at it, and each provides their top tips and most effective lessons in an expanded edition of one of the most popular instruction books you can buy: GOLF Magazine's The Best Instruction Book Ever!The 2012 edition of The Best Instruction Book Ever! 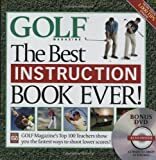 is one of the most extensive lesson manuals ever published, with over 220 pages of first-class instruction and hundreds of proven methods for hitting every conceivable shot, pitch and putt. The Top 100 Teachers in America arm you with the knowledge you need to fix your swing and a steady helping practice drills to make it consistent, repeatable and capable of hitting shots always find the fairway and never leave the pin. 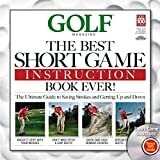 No segment of the game is left uncovered-improve your driving, iron play, short game, putting and trouble shots page by page using the award-winning instruction you can only find in GOLF Magazine.The Best Instruction Book Ever! Expanded Edition features over 1,000 photographs and recipe-style directions to make learning the game and improving your technique fun and easy. It's the ultimate swing guide from the ultimate collection of the game's best teachers. If you're serious about improving, this book will make it happen. Golf Magazine ~ The Best Putting Instruction Guide Ever! Dominate on the green with new ways & proven methods to make the hole look better & sink more putts. Includes stroke tips for a smoother roll, setup secrets for instant success, & the best drills & practice methods with new lessons from the brightest minds in putting! Includes new research, tour-proven stroke methods, drills, flaw fixes, aim & green-read tips, & gear. You will learn how to m ake consistent contact, perfect your path & speed control with these new putting methods. If your golf game has been plagued by inconsistency and less-than-peak performance, you may be going against your "natural swing". But you can improve your golf game dramatically and you can beat bad habits by drawing on talents you already possess. The Natural Golf Swing will:- introduce you to your natural balance and rhythm- let you play consistently to your potential- allow you to enjoy a repeating swing- help you increase power and control with every swingAccording to champion golfer George Knudson, your swing is governed by laws of nature, and is subject to logical, physical fundamentals that are all too often ignored. By learning the simple principles outlined in this book, you will generate more powerful, accurate swings, reduce your score, and gain control over your game.Take advantage of Knudson''s more than 30 years experience on the pro circuit as he guides you step-by-step through the mechanics of the natural swing, from the important first step of maintaining proper balance through the backswing, down-swing, and finishing form. Extensive illustrations and drills help to clarify each step. Knudsen also shares his experience as a golfer on the tour, offering valuable insights into the roles that temperament and concentration play in winning. From one of Golf Digest's Top 5 teachers—a simple, scientific program to build a great swingMost golf instruction is based on helping students emulate the best players, but for top golf teacher Mike Bender, physics provides a better model for developing a swing that is as efficient, consistent, and timeless as that of Iron Byron, the PGA robot that tests clubs and balls. Now Mike Bender shows you how to put the secrets of science into your own swing with a simple, proven program that will take your play to a different level and transform your approach to the game.Explains Mike Bender's unique biomechanical approach to building a simple, repeatable, and effective swingShares the same approach Bender teaches his students, who include two-time U.S. Open winner Lee Janzen, PGA Tour winner Jonathan Byrd, and 2006 LPGA Tour Rookie of the Year Seon Hwa LeeShows you how to build your scientific swing step by stepIncludes 150 photographs to help you put principles into practice on the golf courseIncludes a Foreword by Zach Johnson, 2007 Masters champion and one of Mike Bender's star studentsAs Mike Bender puts it: would you rather fly in an airplane that was built by engineers who understood the principles of lift and acceleration, or would you rather fly in one built by people who simply went out to the airport and watched them taking off and landing? Once you develop a scientific swing, it's your own game that will really soar. An instructional guide to the perfect swing from one of golf’s most successful players and well-known television commentators.“A Swing for Life represents the ultimate collection of lessons, swing thoughts, observations, and discoveries that I relied upon in a career dedicated to the game of golf.” —Sir Nick Faldo Nick Faldo is one of the world’s most accomplished and well-respected golfers. His name is synonymous with the dedication that is necessary to reach the highest levels of the professional game, and the patience with which he analyzed and fine-tuned his swing rewarded him with six major championships. In this extensive book—revised and updated from the 1995 classic—Faldo draws on the wealth of that experience to demonstrate the skills that lie at the heart of the game, tee to green. Revealing a collection of absolute musts that underpin golf’s fundamentals, Faldo explains how to set in motion a chain reaction that inspires a flowing, repeating swing, a technique that can be applied to every club in the bag. There’s a whole chapter dedicated to timing and tempo, featuring the drills and exercises Faldo used to maintain his own trademark rhythm, plus comprehensive lessons on modern driving strategy, short-game technique, bunker play, and the art of putting. Supporting his teaching throughout are superb photographs, as well as twenty-six original videos available for you to download from the book, adding a valuable dimension to the learning experience in every department of the game. For veteran golfers, Faldo’s strategy on “working the ball” reveals the true talent of shot-making and control, while his practical advice on taking your game from the range to the course—the art of visualizing shots and reproducing your skills under pressure—is universally applicable. “At the highest level, golf is all about the respect a player has for the fundamentals—the lessons that have stood the test of time . . . and that’s precisely the message that I am going to make sure comes across in this book.” So says Faldo in his introduction to what is essentially a master class from one of the game’s most exacting students and prolific winners. A Swing for Life promises inspiration for anyone who has ever picked up a golf club.
" It's not a secret that the most vital piece of golf equipment is the human body, yet most golfers believe the best ways to lower scores are big-head drivers, premium golf spikes, and other top-of-the-line tools. It's better physical conditioning that allows the pros to hit drives farther than ever, play 72-hole tournaments nearly every week, and rehabilitate even career-threatening injuries. These pros use the workouts prescribed by the fitness consultant and personal fitness trainer for players on both the PGA Tour and Senior PGA Tour, Kelly Blackburn.In Exercises for Elite Golf Performance, Blackburn provides the same strength and flexibility program the pros use. Whether you're a fitness professional, teaching professional, coach, or a golfer serious about improving your game, this book ensures you're getting the top training program available. It includes 138 illustrated exercises and Blackburn's ""Fitness Analyzer,"" a series of tests golfers use to evaluate their beginning fitness level.By using Blackburn's ""Elite Golf Performance Program,"" your shoulders will be more flexible and will rotate for a fuller backswing, and your stronger hip muscles will help you by putting more power behind the ball without having to consciously swing harder. This will result in longer, more accurate shots that allow you to club down and essentially shorten any course.Don't be fooled into thinking new equipment is the only key in turning your golf game around. Use the pros' workouts to get in shape now and see significant results on your scorecard for the rest of your life. " Using groundbreaking imagery, Nick Bradley's The 7 Laws of the Golf Swing gives readers an incredibly practical blueprint for golf success by giving them the ability to build and maintain their own winning technique.